This week a couple of my colleagues and friends tagged me in a challenge that’s been going around Facebook — sounds fun, I’m game! Beth Cyr (a college classmates from the University of Georgia metals program) and Parker Brown (my friend from SNAG conferences past, and occasional co-conspirator of nerdy art ventures) both challenged me to post images of my work for 5 days straight, and tag another artist to join in. Today is Day 1, so here we go! 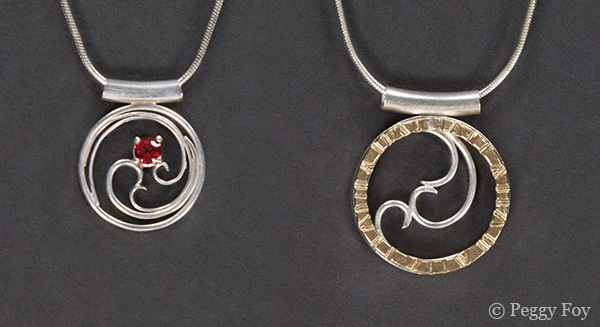 This is a loose collection of Spiral Pendants that I have made in the last 5 years. The first one was a commission piece to re-make a client’s opal ring into a necklace. Since I keep getting orders for more it has turned into a series. Materials: sterling silver, 10k gold, opal; appx 1″ diameter; 2010. 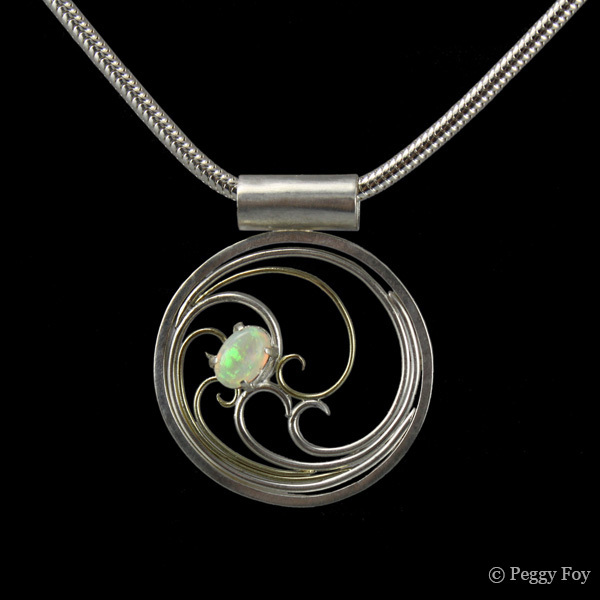 Materials: sterling silver, opals; diameters: appx 1.25″, 1″, and 1″; 2012. Today, I challenge my friend Jennifer Stenhouse to join in! :D If you’d like to follow the challenge on Facebook, make sure to Like my FB artist page: Peggy Foy’s Jewelry. Want to pick up one of these pendants for your own? Visit my Etsy store & tell me how you want it!